Split is the second largest city in Croatia and the biggest city on the Adriatic coast, considered the capital of the region Dalmatia. 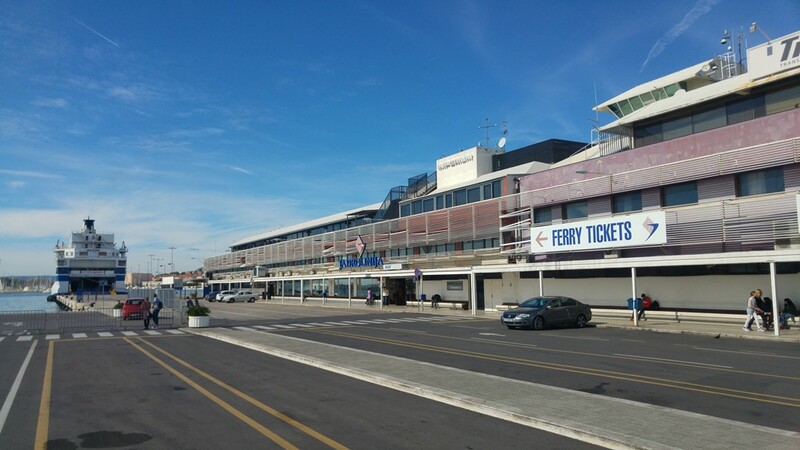 The ferry terminal in Split is the main passenger port in whole Croatia so it’s well connected to many Croatian islands and even Italy. Besides ferries, there are many catamaran lines that depart from Split towards the islands. The ferry terminal in Split is located only minutes away from the exciting historic city centre where you can enjoy visiting the sights in the old Diocletian’s palace. It is also close to some of the famous beaches. 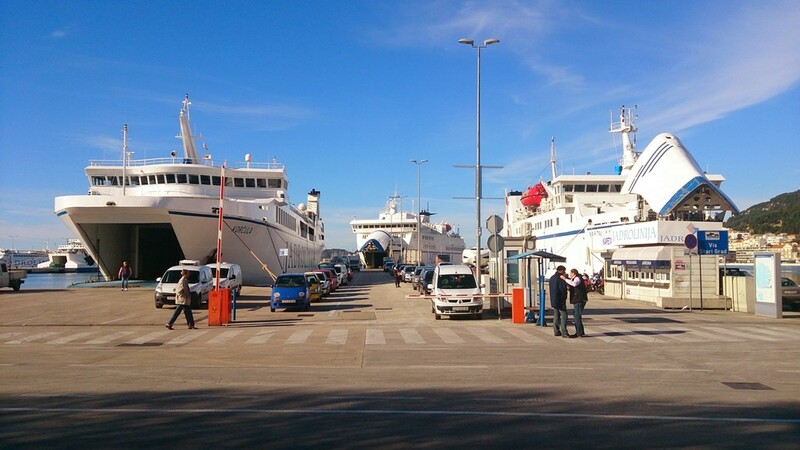 The main bus and train stations are literally across the street from the ferry terminal which makes it perfectly connected with other European and Croatian towns. If you’re staying in Split and if you want to reach the islands of Brač, Šolta, Hvar, Korčula, Vis and so on, here is how you get to the ferry terminal from some popular parts of the town. If you’re staying in the old part of the town, the only way to reach the ferry terminal is to walk there (around 10-15 minutes) since the cars are not allowed in the Diocletian’s palace. If you’re staying in Veli Varoš, it’s pretty much the same thing. There is a main promenade by the sea called Riva between Varoš and the ferry terminal and there are also no cars allowed there. So you’ll have to walk (20-25 minutes) or you can take a taxi in the end of the promenade. It might cost you around 60-70 kn (8-9 euros) since it has to go all the way around the centre to reach the ferry terminal. 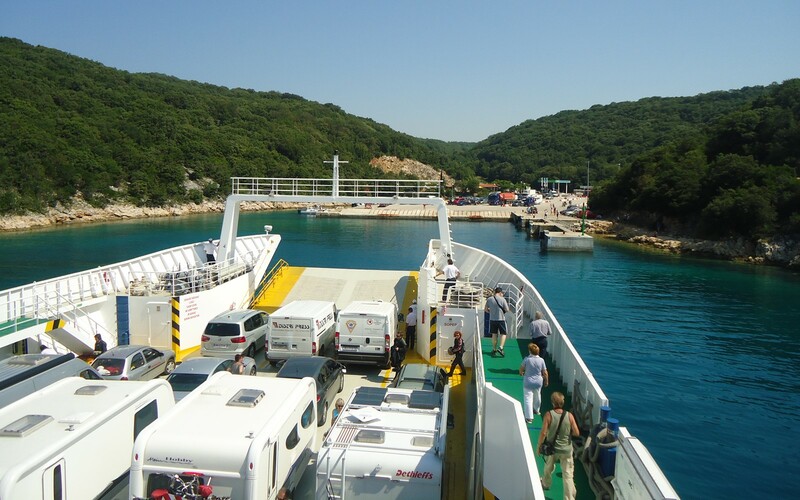 If you’re staying on Bačvice, the ferry terminal is really close. If you’re with luggage, the easiest way is to take a taxi that will take you to the ferry terminal (it won’t cost you a lot since it’s not a big distance). There are many local buses passing on the main road next to Bačvice (numbers 3, 8, 60, 25, etc.) and most of them will take you to the green market which is only minutes away from the ferry terminal. If you’re staying on Meje, you can also take a taxi in front of you apartment/hotel directly to the ferry terminal, which might be a good idea especially if you’re with luggage. You can also take buses number 12 or 21 (depending where on Meje you are staying) that will take you up to the bus stop in the end of the promenade by the sea. From there, you can take a taxi to the ferry terminal (it has to go around a little bit, since there are no cars allowed on the promenade) or you can walk there (15 minutes). The ticket for the local buses is around 11 kn = 1.5 euros bought on the bus. If you’re staying in Omiš, Podstrana or Stobreč, the bus number 60 will take you to the green market, minutes away from the ferry terminal. The ticket to Omiš costs around 20 kn = 2.5 euros and a little bit less for Podstrana and Stobreč. If you are staying in Trogir, the best way is to take a direct bus to the main bus station in Split (across the street from the ferry terminal). The ticket is around 20-30 kn ( 3-4 euros). You can also take a bus number 37 that passes through little villages along the coast (Kaštela). The bus stops little bit outside of the centre on the bus station SUKOIŠAN (not the main bus station! ), so from there it’s best to jump on the bus number 60 and get out at the green market. All the buses run from early morning to late evening and there are pretty much frequent. Please note, that tickets are a little bit less expensive if bought on the kiosk. If you’re arriving from Trogir, Omiš, Podstrana, Stobreč, etc. you can also organise a private transfer. 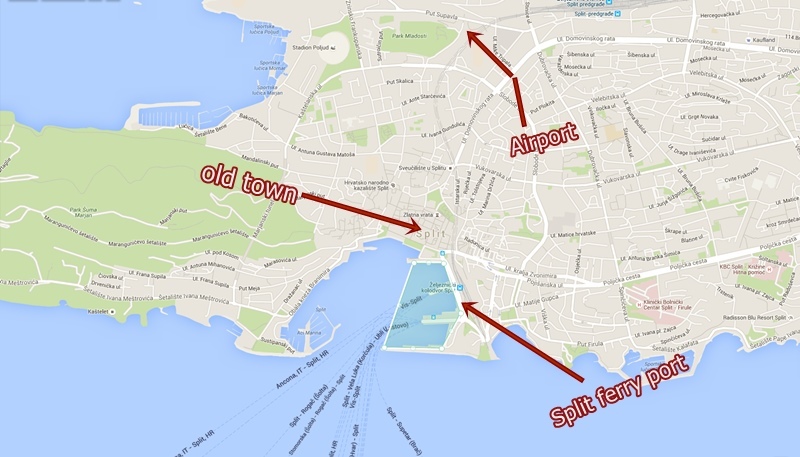 The airport of Split is around 25 km away from Split ferry terminal. Once you land, you can take a pre-booked transfer (which will cost you around 32 euros), take a taxi (that will take you directly to the ferry terminal and it will cost you around 45 euros) and there are also shuttle buses running from the airport towards Split. The direct bus stops at the main bus station that is across the street from the ferry terminal. The one way ticket is around 35 kn = 5 euros. There is also a bus number 37 that passes through little villages along the coast (Kaštela). The bus stops little bit outside of the centre on the bus station SUKOIŠAN (not the main bus station! ), so from there it’s best to jump on the bus number 60 and get out at the greenmarket (minutes away from the ferry terminal). The ticket for the bus number 37 is around 27 kn = a little less than 4 euros. However, if you wish to reach the ferry terminal, this bus might not be suitable, so we highly advise you to take the direct shuttle bus which will take you to the main bus station across the ferry terminal. If you want to read more about transportation from the airport to the ferry terminal, you can click here. Split is very well connected with most Croatian and some European destinations by regular or seasonal bus lines. As mentioned above, the main bus station in Split is located literally across the street from the ferry terminal. You might also want to choose to travel by car. As soon as you enter from Split from either north or south, taking the highway or the coastal road, you will see the sign for the centre and the ferry terminal. All you have to do is follow it and it will get you directly to the ferry terminal. Like already mentioned, it’s one of the biggest Croatian ports, located almost in the town centre and the main promenade (Riva), so it’s obvious that you can find all kinds of facilities there or nearby. On the ferry terminal itself you can find a few tickets offices, a post office, a few ATM-s, all kinds of shops, stands with souvenirs and stuff for the beach, bars, restaurants, fast-foods etc. If you need more, you can always walk to the city centre where you’ll find everything you might need for your holiday.